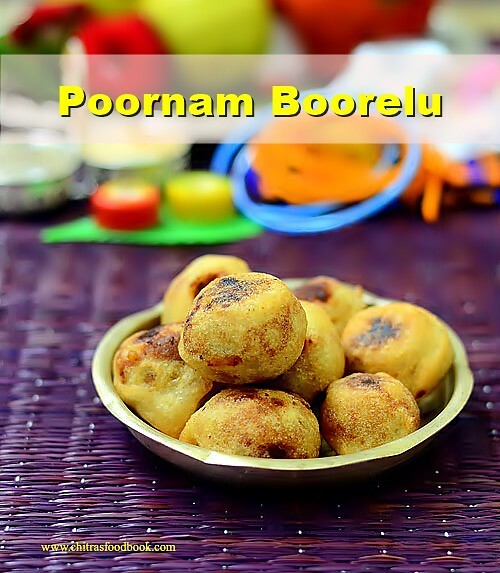 Poornam Boorelu/Poornalu/ Burelu (In Telugu) is one of the most important Neivedyam /Prasadam recipes for Varalakshmi Vratham in Andhra. Most of the people make this during Diwali and Ganesh chaturthi too. 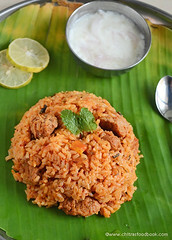 Boorelu is very similar to Tamil nadu style Suzhiyam/Suzhiyan recipe but the ingredients used for the outer covering is different. 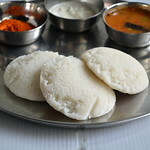 In suzhiyan, maida and rice flour is used for the outer covering whereas boorelu needs rice + urad dal batter (Just like dosa batter) for the covering. Otherwise, the procedure for making Pooranam is one and the same. 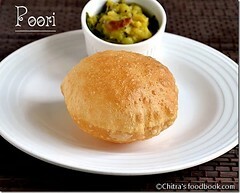 Pooranam ( Stuffing) can be made with Senaga pappu ( Chana Dal ), Pesarapappu ( Moong dal ) or Kobbari ( Coconut). This morning I tried it for pooja and of course to post this special recipe on this Varamahalakshmi festival day. Even though its my first attempt, it came out very well and I am happy with the result. 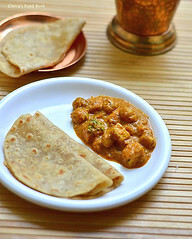 For this recipe, I asked my neighbor Sowjanya who is from Andhra. She told, on Varamahalakshmi, they make a count of 9 boorelu/poornalu and offer to God. 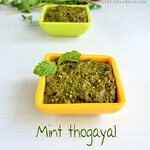 It should be consumed only by the family members after the pooja. So its a must and should sweet recipe to be made for them during this festival.She shared her recipe along with some useful tips too. Thank you Sowjanya for the perfect recipe. We all loved it. 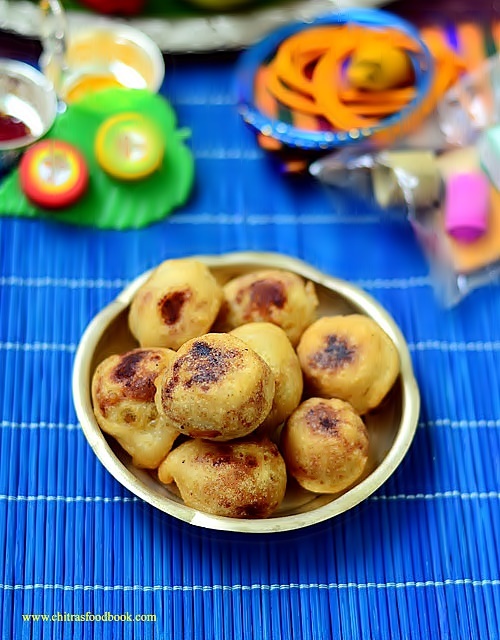 Do try this Andhra special sweet recipe for festivals and have a great celebration. 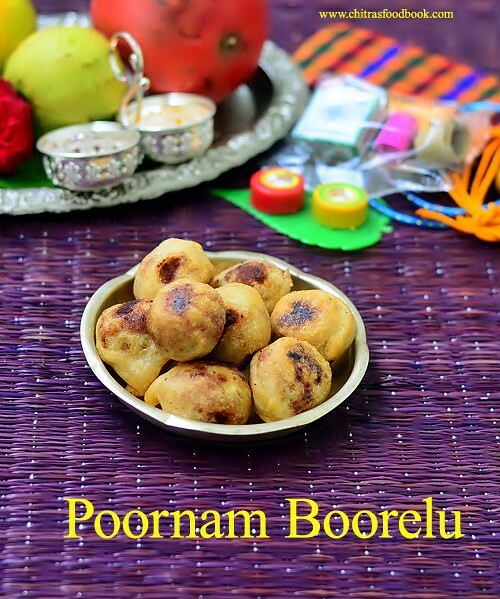 Ok, Lets see how to make Pooranam Boorelu ( Poornalu) with step by step pictures. Wash and soak the rice and dal together for minimum 4 hours. Over night soaking is also fine. 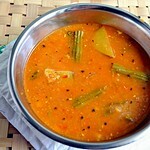 Grind it to a slightly coarse paste in dosa batter consistency adding required water. Make sure batter is not too thin. Set the batter aside for one to 5 hours. 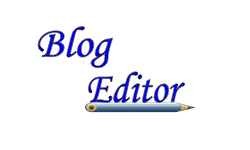 But I used it immediately without resting time. Wash and pressure cook chana dal adding enough water. Chana dal should be blossomed and retain its shape ( i.e when you press the dal, it should become mushy) Do not over cook the dal. Grind it to a coarse paste without adding water or mash it with a ladle. In a pan, melt jaggery adding water. Strain it to remove the impurities using a metal strainer. Boil the syrup till it becomes frothy or reaches one string consistency. Add the ground chana dal paste, cardamom powder and grated coconut. Mix well till it becomes a whole mass and leaves the sides of pan. Switch off the stove and let it become warm. Make balls of golf balls size and arrange in a plate. Heat oil to deep fry. Test the oil temperature by dropping a pinch of batter. If it rises to the top, oil heat is just right. Simmer the flame completely.Take the ground batter, add sugar, mix well. Dip a stuffing ball into the batter using a spoon. Wipe the excess batter in the sides of vessel and deep fry the balls in medium flame till it turns slightly golden with brown spots.Do not fry for long time. Remove in a tissue. Offer to GOD and get the blessings. 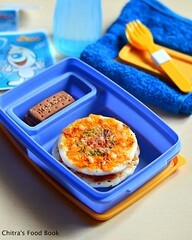 Enjoy eating! NOTE : You should make 9 or 5 balls and offer to GOD. 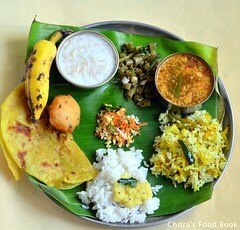 It should be eaten only by the family members.Do not give this as prasad to others. Tip 1 : Adding sugar in the batter gives a mild sweet taste to the outer covering too. So it won't taste bland. Tip 2 : Poornam should be thick and there should not be any moisture content in it else it will disperse in oil when you deep fry the balls.So add besan flour if needed to make the stuffing thick. Tip 3 : If the batter is thin, you can add some rice flour to bring the right consistency. You can use the remaining batter to make dosa or punugulu. 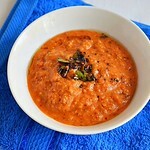 While cooking dal , if u add more water , drain the excess water and grind to a smooth paste. If there is more moisture in the cooked dal, you can add some besan flour to thicken the stuffing quickly. It stays soft and good for 1-2 days. Enjoy this delicious traditional Andhra sweet at home ! 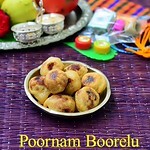 wow delicious looking poornam boorelu :) you have nailed it dear , wonderful presentation as well ..
Looks so delicious.. nice presentation and pics. Simple and clear presentation, especially End of the recipe the "Note" really handy, Grate :) Thank you Chitra and Happy Varalakshmi Vratam!! !